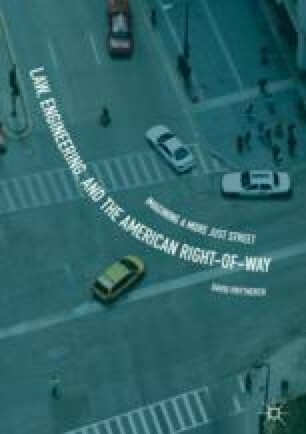 Prytherch draws from wide-ranging debates on the politics of mobility—in transport geography and mobilities studies—to approach the street not merely as infrastructure for movement but also as social space. Linking innovative writings on mobility to those on public space, he interprets access to street as fundamental to the “right to the city.” And while the task of delineating rights remains critical, he suggests a greater challenge is defining what might constitute a more “just street.” The chapter situates emerging writings on mobility justice within a broader literature on social justice in political philosophy, critical geography, and the law to offer an encompassing—yet necessarily bounded—concept of a right to a more just street. He defines a just street as one that fairly distributes the rights and responsibilities of mobility in the public sphere, maximizing access for all while reducing inequity between people and the modes they choose to travel, produced through transparent and democratic decision-making that enhances the capabilities of diverse individuals to enjoy a good life without depriving present or future generations (human and nonhuman) of theirs.